You are here: Home › Is Audacity making you snap? My friend, and client, Kirt Brewer, sent me an email recently, and it reminded me how frustrating Audacity can be. He was having an issue with “snapping.” And he was close to snapping himself. Maybe you’ve had that problem too? If not, you might someday. Just in case, here it is, and here’s how to fix it. I love Audacity. And I really admire the legions of developers who have contributed to its creation and upkeep. Their hard work makes Audacity both useful and free. And that’s a beautiful thing for all of us who make a living at VO. But even the most joyous software can be hard to manage if you accidentally click on something, and don’t know what you clicked on. It can ruin your day – sending you on a wild goose chase trying to figure out what you did and how to fix it. And it can set you back a bit in your already packed schedule. 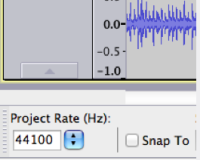 Question…….all of the sudden Audacity is only allowing me to edit in one second interval blocks. Any idea how to get it back to where I start and stop the edit process without it jumping from second to second? I know how soft-spoken as well as resourceful Kirt is – it must have taken a lot to have him write me for an answer. Look at this graphic. Notice that it’s a screen grab of the lower left hand corner of your average Audacity window. And also notice the check box labeled Snap To. That’s where Kirt’s errant click was – he accidentally checked that box. Who knows why, but it happened. And from then on, it was frustrating trying to edit cleanly, when Audacity was dutifully allowing only one-second blocks of selection. Once he unchecked that box, he was good to go. 5 Responses to Is Audacity making you snap? I find Audacity quits more than any other application I’ve ever used. I even reinstalled to see if that would help. Nope. Often, too, when I open a native file, it says there are bits missing. I’m thrilled to be doing my own editing, but it’s a little terrifying, when it quits in the middle of working on a big file. Hey, Marlon! I had that experience, too. Now I save the project immediately. 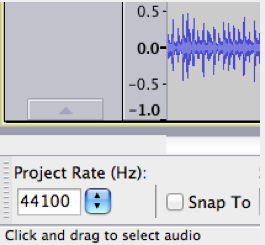 Once the project is saved, I click on the saved project to open it, which in turn brings up the Audacity app. Don’t know if it’s actually the reason, but I’ve had fewer quits and am not getting that missing bits error message any more. As David says, hope this helps! Great article David! These little learning opportunities are so valuable! Thanks for being proactive and sharing this information! I so appreciate these life saving editing tips! Thanks David! Thank you David – loving all the hints and tips to help get my VO career started!